Hyundai engineers set out 11 years ago to develop a world-class hybrid, and with the launch of the Ioniq compact hatchback this month they believe they’ve hit the mark. The Ioniq Hybrid is a car that is more efficient, lower priced and slightly roomier than the hybrid segment’s 800-lb. gorilla, Toyota’s Prius. It also is part of a family of electrified models that will include the Ioniq Electric, being launched in April, and the Ioniq Plug-In Hybrid, which got a late 2017 launch as a 2018 model. Hyundai executives are hoping consumers will find the case for those models as compelling as the Ioniq Hybrid’s. On the consumer front, Hyundai is aiming the Ioniq family at both the Boomer generation that currently is the largest new-car buying group in the U.S and at the Millennial generation of 21- to 40-year-olds. Millenials are projected to become the biggest new-vehicle buying group by 2020. Both groups cite cost as the prime reason for avoiding alternative-powertrain vehicles such as hybrids and EVs, and fuel efficiency as the leading reason for considering them. Hyundai executives believe they’ve covered both bases with the Ioniq. With its EPA rating of 58 mpg for combined city and highway driving, the base Ioniq Hybrid Blue now holds the U.S. record for best overall fuel efficiency among conventional gas-electric hybrids. It bests Toyota’s Prius Eco model by 2 miles per gallon. Ioniq Hybrid models with additional standard equipment and upscale trim packages are rated at 55 mpg overall, almost 6 percent better than the competing compact Prius hatchback models’ ratings of 52 mpg overall. The Ioniq EV doesn’t lead its segment in range, but comes in with a healthy EPA rating of 124 miles per charge, sufficient to satisfy the daily driving needs of more than 90 percent of the driving public. A standard (no extra cost) quick-charging port will enable longer-distance drivers to get an 80 percent recharge in 30 minutes or less on one of the nation’s growing network of high-voltage rapid chargers. The Ioniq PHEV also falls just slightly brhind that segment’s leader. Its EPA rated 29 miles of all-electric drive bests the Prius Prime’s 25 miles, but the Ioniq PHEV gets a rating of 52 mpg in standard hybrid mode and 119 mpg equivalent when starting with a fully charged battery and b lending EV-only and hybrid driving modes. The Prius Prime’s ratings are 54 mpg hybrid and 133 mpg-equivalent in blended EV-hybrid driving. 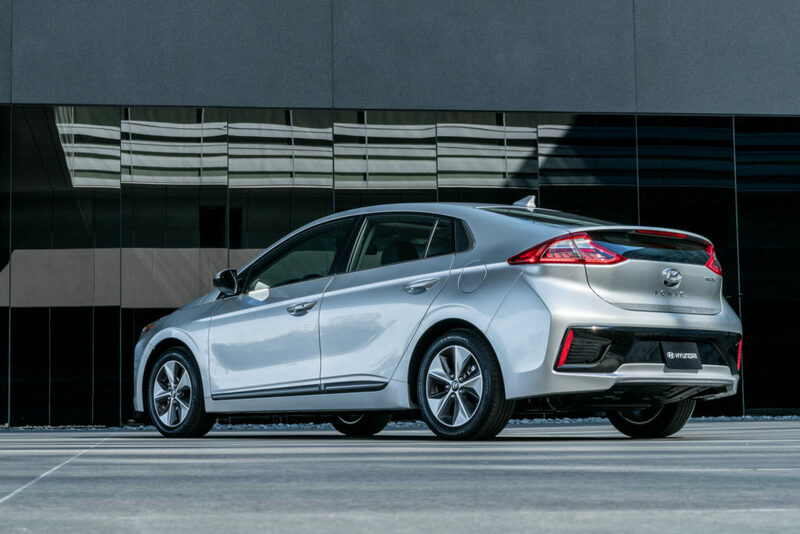 Hyundai ups the ante in the electrified car segment by offering a lifetime warranty on all three of the Ioniq battery packs – hybrid, plug-in hybrid and EV. Size-wise, all three Ioniqs offer 5 cubic feet more passenger cabin volume than the Prius (96.2 cu. ft. vs 91 cu. ft.) in a package that is almost 3 inches shorter, 2.5 inches wider and an inch lower. The Hybrid’s 26.8 cu. ft of cargo space equals the Prius’ 27 cu ft. The much larger battery packs in the Ioniq EV and PHEV rob them of some of that cargo space. Cargo space drops to 23.8 cubic feet in the Ioniq EV, which is still better than competing EVs such as the 2017 Chevrolet Bolt (16.9 cu. ft.), Volkswagen eGolf (22.8 cu. ft.) and Nissan Leaf (23.6 cu ft.). The Ioniq PHEV cargo hold measures 23 cubic feet under the hatch and behind the back seats. Ioniq pricing for the hybrid models starts with the 58 mpg Ioniq Blue, at $2,535 less than the 52 mpg base Prius Two – and the Blue is $3,015 less than the 56 mpg Prius Two Eco. The Ioniq EV Base, which starts at $30,335 before incentives, is $1,210 less than the base Nissan Leaf S, rated at 107 miles of range, and is $520 more than the Volkswagen eGolf, which is EPA-rated at 125 miles of range per charge. The base PHEV starts at $25,835, almost $3,000 less than the Prius Prime plug-in. Hyundai figures the Ioniq Hybrid will compete with the Prius hatchback lineup as well as with the Ford C-Max and the new Kia Niro – which uses the same platform as the Ioniq but is styled as a small wagon or crossover. The Ioniq EV’s main competition looks to be the e-Golf, the Leaf and, for those who don’t mind spending at least $7,160 more for its 238 miles of range, the Chevy Bolt. Main competition for the Ioniq PHEV is toyota’s Prius Prime plug in hybird. No promises were made, but at the press preview for the cars word slipped out that Hyundai is considering a 200-mile (or more) version of the Ioniq EV for next year. Limited with Ultimate Package, $32,935. Purchasers of the Ioniq EV can qualify for a federal income tax credit of up to $7,500, and some states offer state credits or rebates as well. The PHEV qualifies for a federal credit of up to $4,543, plus various state and local incentives. 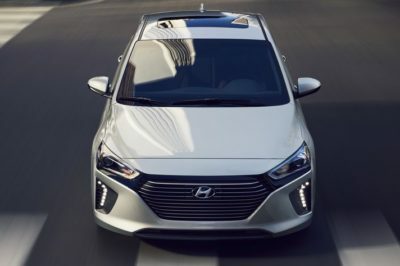 Although any customer in any state can order one from a local dealer (make sure the dealer can service it, though), Hyundai’s official Ioniq EV sales programs initially will be limited to California, which provides a $2,500 rebate to qualified EV purchasers (more for those who meet the state’s low-income purchaser criteria). The Ioniq EV also will be available in an all-inclusive three-year lease program that provides unlimited mileage as well as free maintenance and on-the-road charging for up to 50,000 miles. Hyundai hasn’t announced monthly payment for the EV trim levels, but company executives said the lease cost will reflect credit for the $7,500 federal income tax credit that purchasers would receive. It will be a “zero down payment” program for customers who assign their $2,500 California clean vehicle program rebate to the lease. Hyundai hasn’t yet priced the Ioniq plug-in hybrid, which won’t hit the market until the fourth quarter of 2017 as a 2018 model. But expect it to start somewhere in the range of $26,000-$28,000 before the applicable federal PHEV tax credit and any state credits or rebates.